As we promised in the previous articles, this is the third part of the series of articles on the IT / computer industry in Sri Lanka. What we expect is to give some idea for the students regarding the jobs, its responsibilities and benefits. Then they can learn with an aim. They can decide what they should study and what they should expertise. They can have some plan in life as to what sort of a job they will do and what their life is going to be. It's always good to have some idea than blindly going for some job and expecting to use what you learn. Most of the IT graduates in Sri Lanka join the companies as trainee software engineers, QA engineers or as Business analysts. Of course there are other jobs such as Data Base/systems/network Administration, Web / Graphic designing and Hardware / IT Support. You can get a snap shot of the hierarchy in the IT industry from the below image. Hierachies could be different or flat than this in an actual company. This is only a basic shot. Why you should know the job requirements before you look for a job? I will just give you a list of job names in the IT industry. With a small Google search you can find more details on these such as requirements and responsibilities. Then you can decide where you will fit in and how you should be prepared for your dream job. 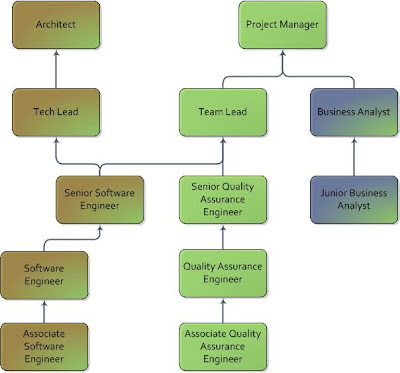 One graduate told me that in his first interview to join as a associate software engineer, all they asked was object oriented concepts. While he was studying he never knew that its such an important lesson. He did not have an in-depth knowledge on object oriented concepts. Therefore he had to be satisfied with some other post. That's one example why you should know what will take you there. This order does not indicate anything. Its just the list it comes to my mind. How to be a specialist in IT field? Mainly you should study on the relevant area. There are specific exams for each of these areas. You can do those other than your basic degree. Same as you can learn on those on own. There are more than enough detailed in internet and there are many books written on each of these subjects. May be I can find some interview questions to help you in joining a company. If you are a hard working person with little bit of brains and right attitude, you can definitely be an expert on one of those fields.